Split Adjustable Bed Sheets – Split Size Adjustable Bed Sizes: Split Queen (Qty 2) 30″x 80″, Split King (Qty 2) 38″x 80″, Split Cal King (Qty 2) 36″x 84″. When shopping for adjustable bed sheets it is very important to know exactly what size bed you have. If you are a new adjustable bed owner and have never purchased sheets for your new adjustable bed, OBS strongly recommends that you first measure both mattresses to determine your exact bed size. 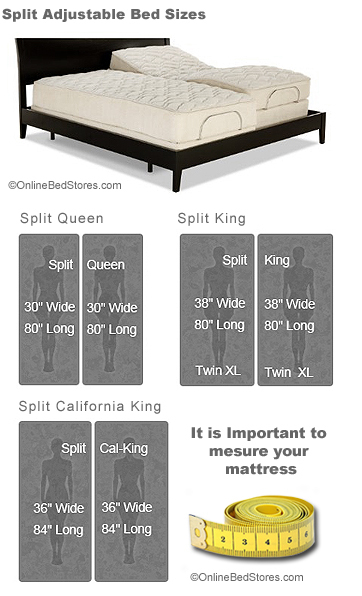 For example a (Split Queen is made up of 2 mattresses measuring 30″ x 80″ each), (Split King is made up of 2 mattresses measuring 38″ x 80″ each) and a (Split Cal King is made up of 2 mattresses measuring 36″ x 84″ each). It is surprising how many new adjustable bed owners purchase the wrong size sheets. 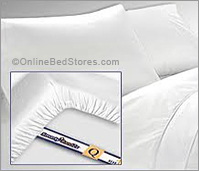 Most online retailers will list their adjustable bed sheets as follows (Split Queen), (Split King), (Split Cal King) see the chart bellow. It is important to note that “Split adjustable bed sheets” almost always include 2 fitted sheets, 1 flat sheet and 2 pillowcases.